Watch a time-lapse video as the Falcon Heavy goes vertical at launch pad 39A on December 28, 2017. The video runs at 34 times normal speed. This video is made possible by the generous support of Spaceflight Now members. Join today. We appreciate your support. The fully-assembled 229-foot-tall (70-meter) rocket will be the most powerful in the world when it blasts off, and Thursday’s arrival atop pad 39A marks a major step toward readying the Falcon Heavy for flight. SpaceX engineers are expected to conduct a fit check and complete other tests at pad 39A this week, followed by a hold-down firing of all 27 first stage engines some time after New Year’s Day. The company has not set a target date for the Falcon Heavy’s first liftoff, but officials say the launch is targeted in January, some time after the hold-down hotfire test. Become a Spaceflight Now member to watch live video of the Falcon Heavy at pad 39A. 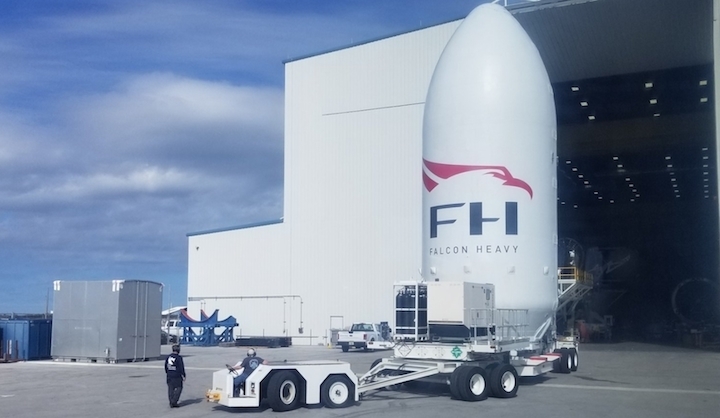 The Falcon Heavy’s inaugural test launch will have a dummy payload on-board, but SpaceX has readied a flashier, more colorful passenger than the boilerplates and water ballast carried on previous test flights of new heavy-lift launchers. SpaceX founder and chief executive Elon Musk decided to place one of his Tesla Roadsters on-board the Falcon Heavy, a cherry red creation from Musk’s electric car company. The Falcon Heavy will attempt to give the automobile enough speed to escape the grasp of Earth’s gravity, sending it into a heliocentric solar orbit that will take it to the approximate distance of Mars from the sun. When it blasts off next month, the heavy-lifter will generate about 4.7 million pounds of thrust at launch. Musk said the first Falcon Heavy’s engines will be throttled to 92 percent of full power. That will make the Falcon Heavy the most powerful rocket flying today, exceeding the European Ariane 5 launcher, the world’s leader in liftoff power at 2.9 million pound of thrust from two segmented solid rocket boosters and a core engine. SpaceX’s new rocket will produce more thrust than any launch vehicle since the space shuttle. 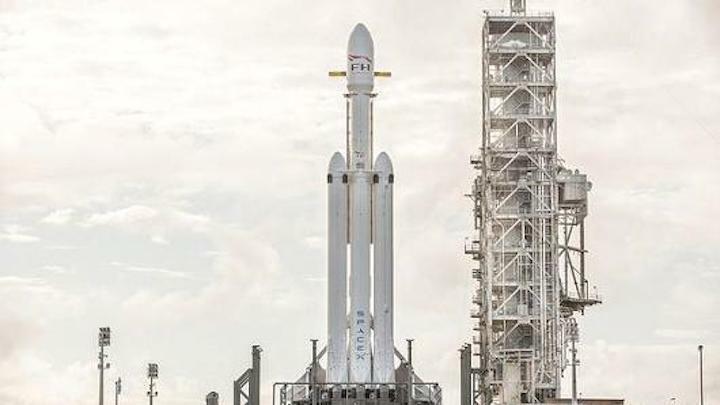 The Falcon Heavy will also be able to carry more payload into orbit than any other rocket in the world, a more important measure of the rocket’s lifting capacity. The Delta 4-Heavy rocket, operated by SpaceX rival United Launch Alliance, can haul up to 63,471 pounds (28,790 kilograms) to a low-altitude orbit approximately 120 miles (200 kilometers) above Earth when launched to the east from Cape Canaveral, according to a launch vehicle data sheet published by ULA. When its first stage boosters are not recovered, SpaceX’s Falcon Heavy will be capable of delivering up to 140,660 pounds (63,800 kilograms) to low Earth orbit when launched to the east from Florida’s Space Coast, where rockets get a velocity boost from Earth’s rotation. 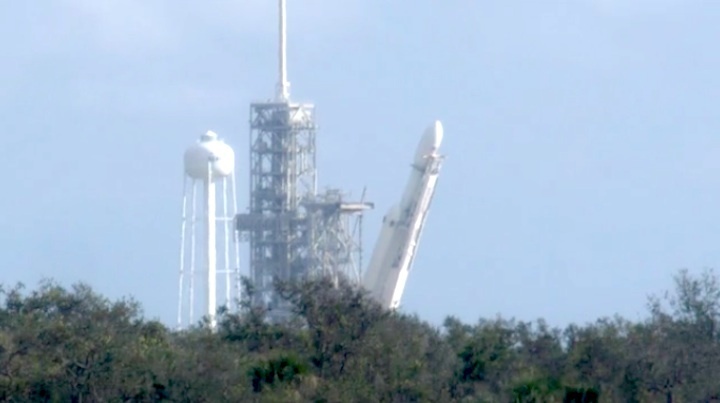 But SpaceX intends to land all three first stage boosters on the Falcon Heavy, eating into the rocket’s propellant reserves and reducing the weight it can loft into orbit. For the maiden flight next month, the Falcon Heavy’s two side boosters, recovered and modified from Falcon 9 flights in 2016, will cut off and return to Cape Canaveral Air Force Station for near-simultaneous landings. The center core, a newly-built booster, will head for landing on SpaceX’s floating platform in the Atlantic Ocean. reliability of Falcon 9. Its first stage is composed of three Falcon 9 nine-engine cores whose 27 Merlin engines together generate more than 5 million pounds of thrust at liftoff, equal to approximately eighteen 747 aircraft. Only the Saturn V moon rocket, last flown in 1973, delivered more payload to orbit. Falcon Heavy was designed from the outset to carry humans into space and restores the possibility of flying missions with crew to the Moon or Mars. 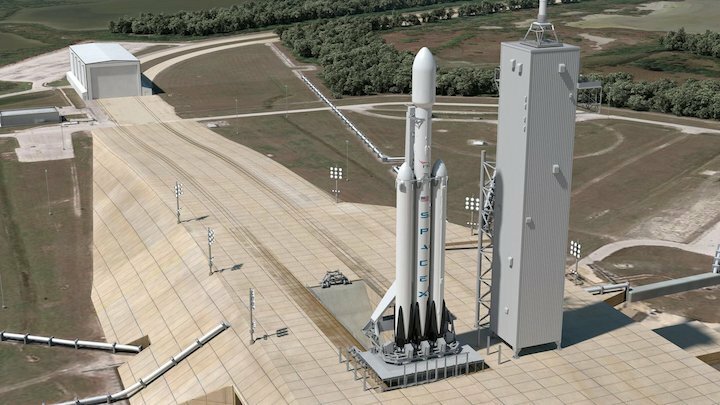 Falcon Heavy missions will deliver large payloads to orbit inside a composite fairing, but the rocket can also carry the Dragon spacecraft. The composite payload fairing protects satellites during delivery to destinations in low Earth orbit (LEO), geosynchronous transfer orbit (GTO) and beyond. Falcon Heavy draws upon Falcon 9’s proven design, which minimizes stage separation events and maximizes reliability. The second-stage Merlin engine, identical to its counterpart on Falcon 9, delivers the rocket’s payload to orbit after the main engines cut off and the first-stage cores separate. The engine can be restarted multiple times to place payloads into a variety of orbits including low Earth, geosynchronous transfer orbit (GTO) and geosynchronous orbit (GSO). 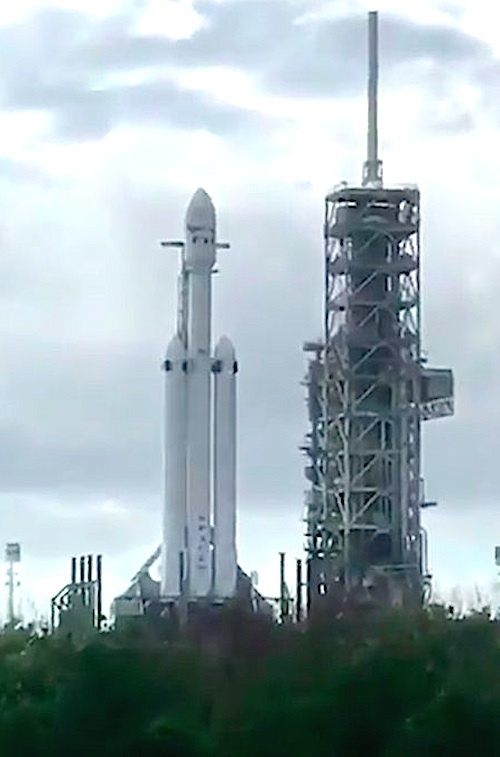 Three cores make up the first stage of Falcon Heavy. 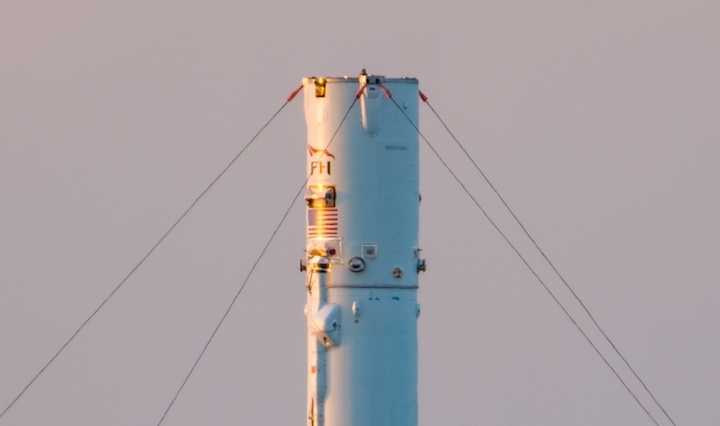 The side cores, or boosters, are connected at the base and at the top of the center core’s liquid oxygen tank. The three cores, with a total of 27 Merlin engines, generate 22,819 kilonewtons (5.13 million pounds) of thrust at liftoff. Shortly after liftoff the center core engines are throttled down. After the side cores separate, the center core engines throttle back up to full thrust. Each of Falcon Heavy’s side cores, or boosters, is equivalent to the first stage of a Falcon 9 rocket with nine Merlin engines. At liftoff, the boosters and the center core all operate at full thrust. Shortly after liftoff, the center core engines are throttled down. After the side cores separate, the center core engines throttle back up. Inside each of Falcon Heavy’s three cores is a cluster of nine Merlin engines. These same engines power Falcon 9, enabling efficiencies that make Falcon Heavy the most cost-effective heavy-lift launch vehicle in the world. With a total of 27 first-stage engines, Falcon Heavy has engine-out capability that no other launch vehicle can match—under most payload scenarios, it can sustain more than one unplanned engine shutdown at any point in flight and still successfully complete its mission. SpaceX’s payload fairing, a composite structure fabricated in-house by SpaceX, protects satellites during delivery to low-Earth orbit (LEO), geosynchronous transfer orbit (GTO) and beyond. Falcon Heavy’s first stage is equipped with hypersonic grid fins which manipulate the direction of the stage’s lift during reentry. The tanks of Falcon Heavy’s three first-stage cores and second stage are made of aluminum-lithium alloy, a material made stronger and lighter than aluminum by the addition of lithium. Falcon Heavy was designed to be fully reusable. Both the center core and side boosters carry landing legs, which will land each core safely on Earth after takeoff. The twenty-seven Merlin engines that power Falcon Heavy's three cores are arranged in an Octaweb structure, with eight engines surrounding one center engine on each core. The Merlin engine that powers all three Falcon Heavy cores was developed internally by SpaceX, drawing upon a long heritage of space-proven engines. A key design at the heart of Merlin was first used for the Apollo lunar landing module. Encapsulated in the rocket's nose cone, however, isn't a typical payload: CEO Elon Musk is sending his red 2008 Tesla Roadster to deep space as part of the demonstration flight. Expect David Bowie's "Space Oddity" to be playing on the all-electric sports car's sound system before launch, he said. When the 40-foot-wide Falcon Heavy lifts off, its 5.1 million pounds of thrust will make it the most powerful rocket in the world – and the most powerful to launch from pad 39A since the storied Saturn V rocket of the Apollo era. After liftoff, all three of its 156-foot-tall boosters are expected to descend for landings – the two side cores at Cape Canaveral Air Force Station's Landing Zone 1, and the center core on the Of Course I Still Love You drone ship stationed in the Atlantic Ocean. That means Space Coast spectators can expect a doubling of the dramatics typically involved in a Falcon 9 landing, including twice the sonic boom energy when the boosters cross the speed-of-sound threshold. 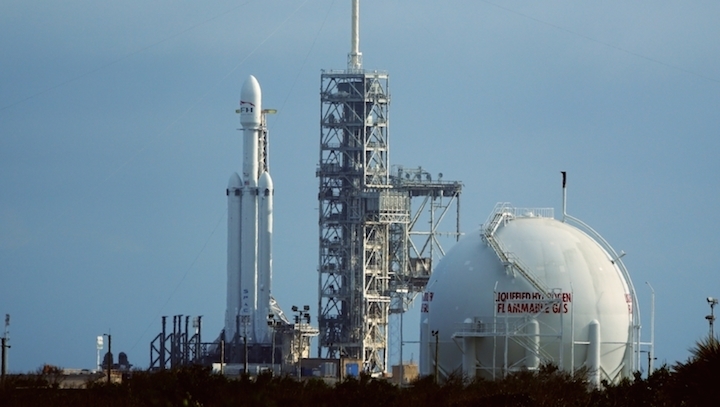 Falcon Heavy promises to lift heavier payloads to higher orbits, which could lead to more lucrative contracts for SpaceX. The company advertises crewed trips to the moon or Mars as being within its capabilities, too. 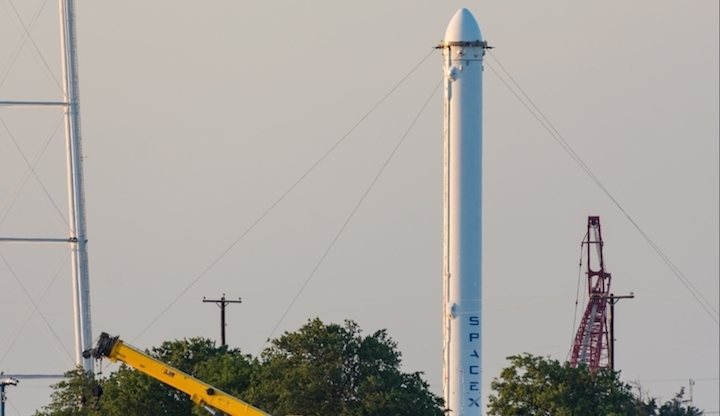 Elon Musk startet im Januar seine Falcon-Heavy-Rakete. Geplant ist eine gigantische Raumfahrtsshow. Doch hinter dem genialen Marketinggag verbirgt sich pure Angst. Ufo-Alarm in Los Angeles: Helles Licht und seltsame Rauchwolken erleuchteten kürzlich den Himmel über Los Angeles. In den sozialen Netzen wurde heiß diskutiert, wer hinter dem unbekannten Flugobjekt über Kalifornien stecken könnte. Der Multiunternehmer Elon Musk konnte darüber nur lächeln. Er heizte scherzhaft per Twitter die Spekulationen noch mit dem makabren Scherz an, es handele sich womöglich um ein „nukleares außerirdisches Ufo aus Nordkorea“. Wenig später erklärte Musk die Himmelserscheinung dann mit dem Start einer Rakete seiner Raumfahrtfirma SpaceX. Also kein Grund, sich aufzuregen, lautete die Botschaft. Außerdem stünde ein gewaltiges Himmelsspektakel erst noch bevor. Musk versprach, mit dem ersten Start seiner Falcon-Heavy-Rakete alles bisher Gesehene in den Schatten zu stellen. Tatsächlich wird die nun für Januar geplante Premiere der Falcon Heavy ein in der Raumfahrtgeschichte einmaliges Ereignis der Superlative. Und das in mehrfacher Hinsicht: Mit Blick auf die Technik der Rakete, die geplante Rückkehr von drei Raketenstufen zur Erde sowie der Nutzlast – einem roten Tesla-Sportwagen, der durch den Weltraum in Richtung Mars fliegen soll. Weil Musk schon im Vorfeld des Starts mehrfach davon gesprochen hat, dass beim Erstflug der Falcon Heavy „sehr viel schiefgehen kann“, bewegen sich die Premienerwartungen zwischen zwei Extremen: Im besten Fall klappt der Start der dann weltweit schubstärksten Rakete. Die Mission würde zum Doppelhöhepunkt für die Musk-Unternehmen SpaceX, für die Raumfahrt und Tesla als Elektroautofirma mit einer Werbeaktion für den Roadster. Im schlechtesten Fall scheitert der Start von der historischen Startplattform im Kennedy Space Center in Florida – von der bereits die Saturn-Rakete zur ersten Mondlandung abhob. Kommt es zur Explosion, wäre es einer der größten Unfälle auf dem Nasa-Weltraumbahnhof. Zu den Besonderheiten der Rakete gehört, dass die erste Antriebsstufe wiederverwendet werden kann. Das soll Kosten sparen. Die Falcon Heavy ist also keine Wegwerfrakete, deren erste Stufe ausgebrannt irgendwo im Meer versinkt oder wie bei den Russen in einer Steppe aufschlägt. 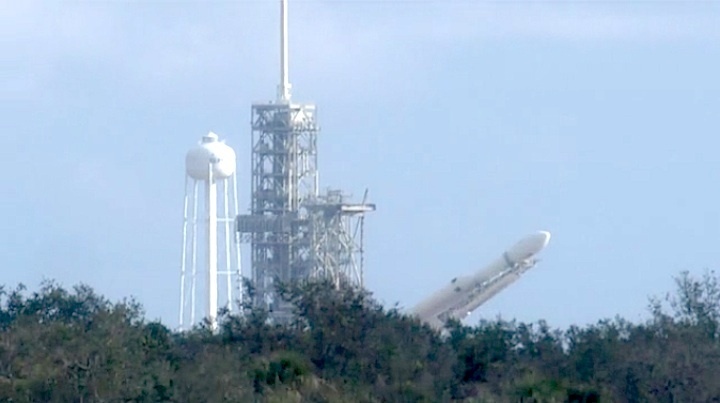 Vereinfacht dargestellt sind bei der Falcon Heavy beim Start drei Antriebsstufen des aktuellen Modells Falcon 9 gebündelt. Zwei davon, genutzt als seitliche Booster, sollen nach dem Verbrauch ihres Treibstoffs auf ihrer Flugbahn im Weltraum umkehren. Sie sollen zurück zum Startplatz in Florida fliegen und dort auf Landebeinen senkrecht nahezu parallel wieder aufsetzen. Erwartet werden spektakuläre Live-Bilder aus den Raketenstufen. Die zentrale erste Stufe soll auf einer schwimmenden Plattform im Atlantik ebenfalls sanft landen – während die Oberstufe weiter in den Weltraum fliegt und den roten Sportwagen in Flugrichtung Mars abliefert. Die technische Glanzleistung mit dem Rückflug von Raketenstufen aus dem All auf Landeplätze an Land oder auf Meeresplattformen wurde von SpaceX bereits 19 Mal erfolgreich demonstriert. Aber noch nie wurde das Manöver im Dreierpack versucht. Zu den Besonderheiten der Rakete gehört auch die unglaubliche Zahl von drei mal neun, also 27 Triebwerken, die beim Start nahezu gleichzeitig gezündet werden. Keine US-Rakete hatte jemals mehr Triebwerke. Die Zündung der Triebwerke im Abstand von Millisekunden gilt als eine der großen technischen Herausforderungen. Die 70 Meter hohe Rakete habe einen Maximalschub von 5,1 Millionen Pfund oder 2300 Tonnen. Der Schub sei vergleichbar mit der Kraft von 18 Boeing Jumbojets, erläutert Musk. Die Falcon Heavy könne bis zu 63 Tonnen in eine niedrige Erdumlaufbahn befördern – oder mit knapp 17 Tonnen bis zum Mars fliegen. Nur die 1973 ausrangierte Saturn-V-Mondrakete habe größere Gewichte ins Weltall transportiert. Mehr Triebwerke als die Falcon Heavy hatte nur die gigantische sowjetische Mondrakete N-1 Herkules, mit der Moskau eigentlich den Wettlauf zum Mond gegen die USA gewinnen wollte. Die Entwicklung der Rakete mit 30 Triebwerken endete aber dramatisch. Bei vier Starts zwischen Februar 1969 und November 1972 gab es vier Fehlschläge. Die Explosion einer N-1 im Juli 1969 kurz nach dem Start gehört zu den größten Raumfahrtunfällen in der Geschichte der Raumfahrt. Der Startplatz in Baikonur in Kasachstan wurde dem Erdboden gleichgemacht. Ein solches Desaster will Elon Musk mit seiner Falcon Heavy auf jeden Fall auf dem Nasa-Weltraumbahnhof vermeiden. Noch ist das genaue Startdatum im Januar nicht bekannt, aber die Sicherheitsvorkehrungen werden gewaltig sein. In Expertenkreisen wird es als cleverer Schachzug gewertet, in die Raketenspitze keine kommerzielle Nutzlast zu packen. Stattdessen wird die Marsmission mit Tesla an Bord zur Riesenwerbeaktion für den Elektroautobauer. Zu oft hat es bei Raketenpremieren Fehlschläge gegeben. Beispielsweise zerbrach Europas Ariane-5-Rakete beim Erstflug 1996 in der Luft und wurde gesprengt. Kritiker verweisen darauf, dass die Falcon Heavy bereits 2013 starten sollte, also etwa fünf Jahre hinter dem Zeitplan liegt. Musk hatte im Gegenzug darauf verwiesen, dass die technischen Herausforderungen größer als zunächst erwartet waren und Entwicklerkapazitäten auch für seine aktuelle Rakete Falcon 9 gebraucht wurden. 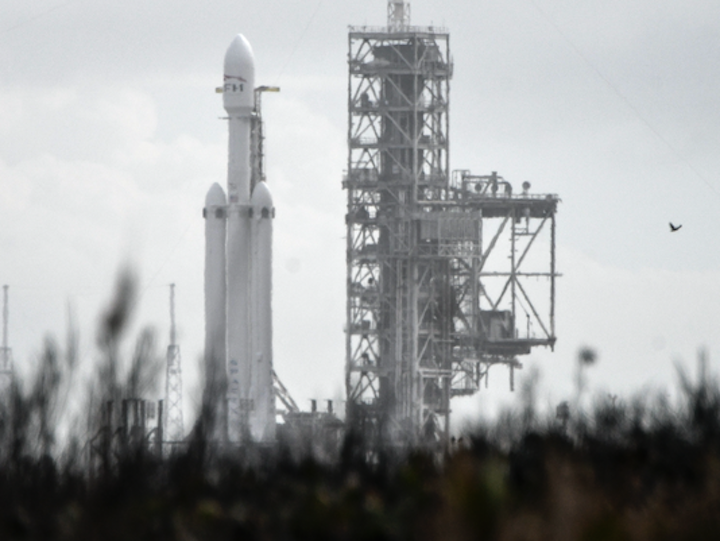 Die Startkosten für eine Falcon Heavy beziffert SpaceX auf rund 90 Millionen Dollar – für einen Satelliten auf einer geostationären Umlaufbahn. Wie bei SpaceX und anderen Raketenanbietern üblich, gibt es ohnehin keine volle Preistransparenz. Je nach Missionsprofil sollen auch nicht alle drei ersten Startstufen der Rakete wiederverwendet werden. Beim Premierenstart wird zwar noch kein zahlender Kunde die Rakete nutzen, aber es gibt bereits Reservierungen. So hat Saudi-Arabien eine Mission mit einem Telekommunikationssatelliten vorgemerkt. Zu den Kunden gehört auch das Pentagon zur Erprobung neuer Weltraumtechnik. Klappt alles nach Plan, soll die von SpaceX entwickelte Raumkapsel Dragon 2 mit zwei Weltraumtouristen bereits Ende 2018 zu einem Flug um den Mond abheben – an der Spitze einer Falcon Heavy. Noch hat Elon Musk nicht verkündet, wer mit seiner Superrakete starten soll. Es wäre ohnehin ein unglaublich ambitionierter Zeitplan zwischen dem Premierenflug, bei dem ein Auto zum Mars geschickt wird und einer bemannten Mondumkreisung. SpaceX claims the Falcon Heavy is the "most powerful rocket in the world by a factor of two"
SpaceX will launch its biggest rocket yet, called the Falcon Heavy, at the end of the month, Chief Executive Elon Musk announced on social media late Thursday. The billionaire's space exploration company claims the Falcon Heavy is the "most powerful rocket in the world by a factor of two." Musk said in an Instagram post Thursday that, at 2,500 tons of thrust, the rocket is equivalent to 18 Boeing 747 aircraft at full throttle. Musk also revealed that the rocket would carry out a test fire next week with a full launch at the end of the month. Until now, there was no date set for the launch. 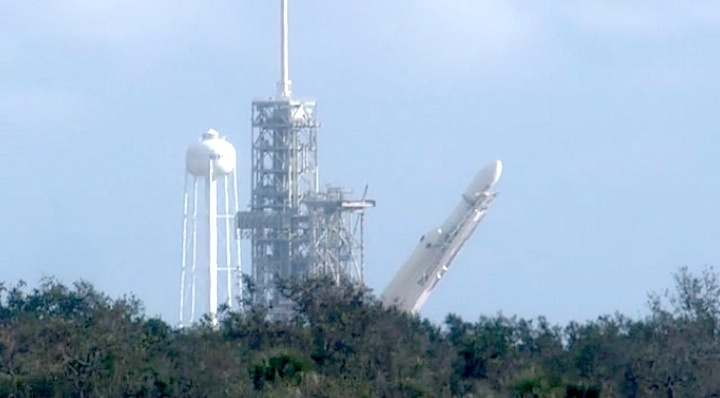 The Falcon Heavy has suffered multiple delays. Last year, Musk admitted that the development of the rocket had been "way harder" than he had anticipated. For the test flight, the rocket will not carry a customer's payload. Instead, Musk will launch an original Tesla Roadster playing David Bowie's "Space Oddity" into "a billion year elliptic Mars orbit." Musk is also CEO of Tesla. SpaceX does have some customers for the Falcon Heavy lined up, however. These include satellite firms Arabsat and Inmarsat, and the U.S. Air Force. There are no concrete dates for these launches. 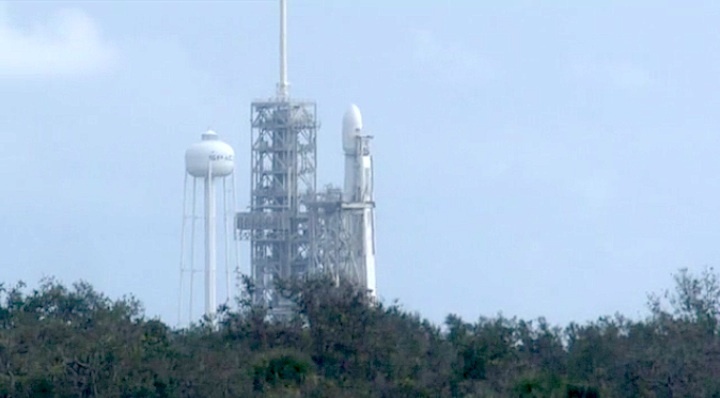 The Falcon Heavy test will take place at the Kennedy Space Center's Launch Complex 39A. SpaceX has been ramping up its launches. The company's rockets are able to take a payload to space then land back on a droneship in the sea so they can be reused. SpaceX said that this reduces the cost of flights and allows it to do more frequent launches. It aims to launch a payload every two weeks. The company is currently gearing up to launch a classified U.S. government payload codenamed "Zuma" this weekend.